This great hand-pad is ergonomically shaped so it fits most hands perfectly and bringing comfort and ease while working. The black pad&apos;s foam-composition is firm enough to withstand added pressure during final finishing to remove swirls. It has no cut and will apply thin, even coats of waxes, sealants and glazes. 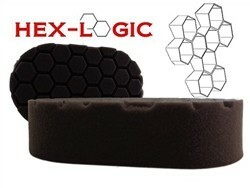 Hex-Logic Hand-Pads keep the product in the ""channels"" and apply it with the lightes pressure so you ""feed"" your surface with new product and polish in circular movements as you go... These pads easily bend over every surface to make the best contact with your paint as possible. Ourselves are that happy with it that it maybe even is the best product we launched this year. Hex-Logic Pads are 100% manufactured and designed in California U.S.A.
- The 6-sided design guarantees a correct and safe distribution of ""product"" through the ""channels""